Dr Paul O’Mahony, author of MUP’s bestselling book, The Irish War on Drugs, makes this controversial statement in an article published in The Irish Times this week. Carol Coulter, Legal Affairs Editor at The Irish Times talks to Dr O’Mahony about his views on Ireland’s drug culture. Read the article in full, online. 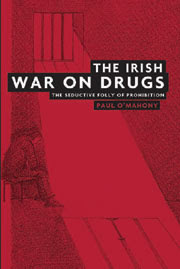 Or find out more about Dr O’Mahony’s arguments in The Irish War on Drugs, available to buy online or at all good bookshops. Category: Irish Studies, Politics, Uncategorized	20 Comments.